Helping you get a website up and running without a lot of effort is the main goal of our Layout Pack Use Cases initiative. 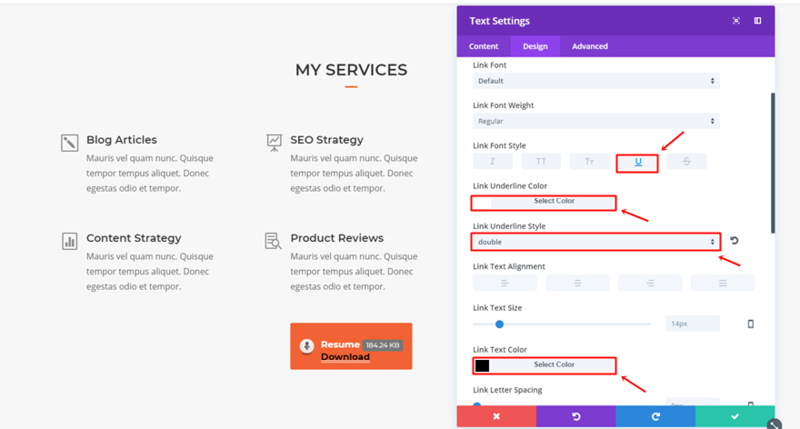 And this time, we’re helping you set up a copywriter website with the free Copywriter Layout Pack for Divi. 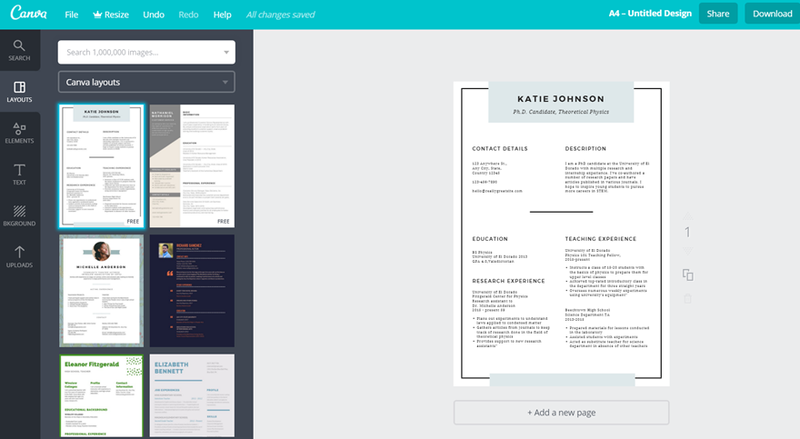 Although this layout pack already has most of the elements your copywriter website needs, in this use case tutorial, we’re going to help you take it a step further by showing you how to add resume downloads and typing effects. These two additions will not only enhance the appearance of your website but will also help you discover your visitors’ needs. For the resume download, we’re going to replace one of the buttons on the homepage into a download button that contains the resume file. You can use the typing effect practically anywhere on your website. We’re going to give you a headstart by showing you how to use it in the hero section of the homepage. 3. Download the Layout Pack and Import the Copywriter_All.json file to your Divi Theme Library. Start off by downloading the WordPress Download Manager plugin by going to the following page and clicking on the download button. Then, go to your WordPress website and upload the plugin by going to Plugins > Add New. Once you’ve uploaded the plugin, make sure you activate it as well. The next thing you will need is your resume file. If you don’t have one yet, you can easily create one without having any Photoshop experience by using Canva. Canva offers a ton of free pre-made designs for all kinds of purposes, resumes included. Once you’ve located your resume or created one, it’s time to add it to your Download Manager plugin. To do that, go to Downloads > All Files > Add New. Then, add a title to your file and upload your resume. Once you’ve added your resume as a downloadable file, you can add it to your website. Start by enabling the Visual Builder on your homepage. Then, scroll down until you come across the services section and remove the Button Module that’s located at the bottom of it. Instead of using a Button Module, we’re going to use a Text Module that contains our download shortcode. Go ahead and add the shortcode to the Content Box within the Content tab. Scroll down the Content tab, open the Background subcategory and add ‘#f16334’ as the background color. The Text Module needs some rounded corners as well. Open the Border subcategory and add ‘3px’ to all of the corners. 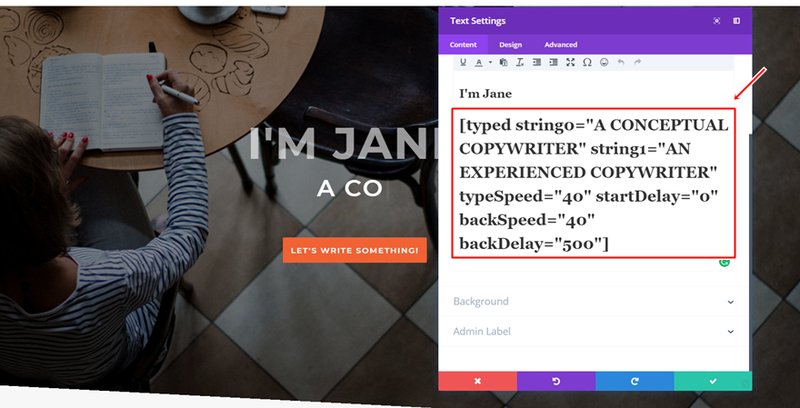 Once you’ve added the resume download to your copywriter website, you can move on to the typing plugin. To download the free plugin, go to the following page and click on the download button. Then, install the plugin by going to Plugins > Add New > Uploading the plugin. Make sure you activate the plugin as well. Once you’ve installed the plugin, you can start using the typing effect for any sentence you want. You can use it for one sentence in particular or add as many sentences that follow up on each other. Using multiple phrases allows you to share more content while people read the typing effect. Another thing you can do with this plugin is changing the speed and delay. You can also enable the ‘loop’ options which will keep the interaction going on your page. Once you have chosen all of your sentences and modified the settings, you can click on ‘Generate Shortcode’ which will share a custom shortcode that you can add to your homepage. Make sure you copy it beforehand. Then, open the homepage with the Visual Builder and replace the second sentence within your hero section Text Module with the shortcode. Make sure that you are replacing the text (instead of removing it) so the appearance of your text remains the same as it was before. In this post, we’ve shown you how you can take your copywriter to the next level with two things; resume downloads and typing effects. 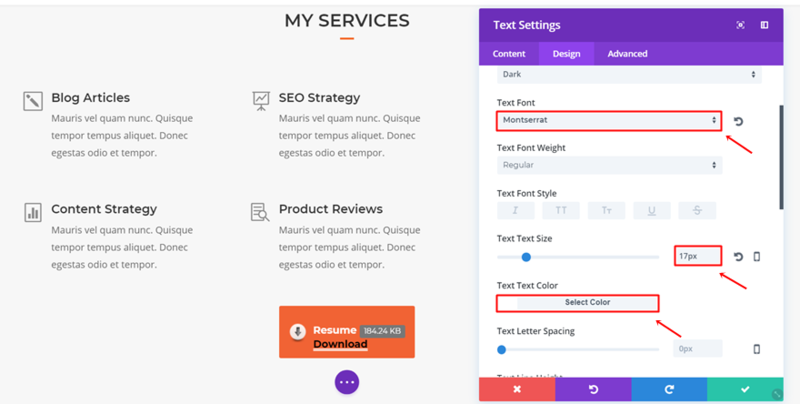 This use case goes perfectly with the free Copywriter Layout Pack for Divi and is part of our ongoing Divi initiative where we try to put something extra into your design toolbox each and every week. If you have any questions or suggestions; make sure you leave a comment in the comment section below! Thank you, a very useful post. Shouldn’t we write “Résumé” (and not “resume”)? I agree that being the grammar police for no good reason is troll-ish behavior; but in this instance, the feedback is warranted. It is not clear because “resuming a download” is something that makes sense in the context of this company’s specialty. The accent marks would have made the meaning clear right away. My first thought when seeing “resume download button” was: is it something about “resuming download that was interrupted”? What a difference a small accent mark makes! Thanks to Donjete for two interesting plugins suggestions (even though in this particular case – a simple download button – it is probably an overkill). But your feedback sounded as though it were negative; instead of giving a constructive feedback, you went straight to pointing out typos in the thread. Which is OK, but not teacher-ish. Wouldn’t you agree that after giving accumulative appreciation of a product that is for free, you at the end put into parentheses “(Hey, one thing: it’s spelled: Résumé)” Good work. I’m searching for a way to give customers a download, but after filling in a contactformular. Do you know a way? You can either A) send a download link (or the file itself) in an automatic confirmation e-mail, B) have the user confirm their form submission and *then* give them the download link, C) redirect to a page with the download after submission or D) show the download link in the success message shown after submission. The available options depend on what form software you use on your site. great stuff. May I suggest an “ultimate resource guide” post with all of the best Go-to PLugins the Divi team suggest. Typing Effect Plugin does not work properly with IE and Edge. With more than one string the order of the sentences is not respected. Why not just use a Divi button for the download? There is a divi tutorial on this somewhere, very easy, not need for additional plugin.